Click to view the Answers. We do not cover the costs for returning & shipping out exchanges. Customers are responsible for all return shipment costs. We estimate it will cost $10 to have your jersey mailed back to us, exchanged for a new size, and mailed out back to you. So long as the jersey is received back to us in perfect condition, there would be no restocking fee & we would be happy to make it work for you. *Note: the Youth XS size is a great fit for most women. We currently only accept payment via PayPal. If you do not already have a PayPal account, it’s free to sign up. You can link your credit card, debit card, and bank accounts securely. Click here to sign up for PayPal. You may also check out with a Credit or Debit card using the PayPal services as a guest, without signing up for an account. We currently ship all of our products using the United State Postal Service (USPS). We use a Priority Flat Rate Shipping envelope which costs *$5.75 (rates subject to change via USPS.com). This includes $50 worth of Insurance and a Tracking ID number. We will ship to any of the 50 states within the continental United States. For international orders, please Contact Us for a custom quote. How do I Wash my Jersey? We recommend always washing your jerseys in Cold Water and Air Drying them for best results. It is safe to Iron for maximum crispiness. For all the ballers out there, we also recommend having your garments Dry Cleaned. 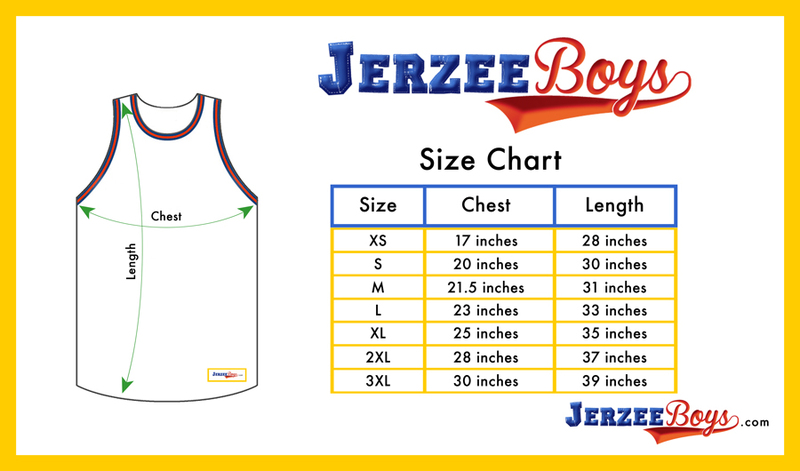 Can I have a JerzeeBoys catalog? Yes! Our catalogs are available in digital form. Click here to view & save. Are your jerseys High Quality? Our jerseys are made from the highest quality materials and are manufactured by the same factory that produces officially licensed professional sports apparel. Jersey mesh is made from 100% thick polyester and is super breathable. All logos are embroidered right into the mesh. 100% ring-spun cotton knitted collars and armholes with no label in neck area. Tackle twill stars (on select styles) are appliquéd down both sides of Jersey.